Adulting is overrated. Let them live in the moment and be a kid for kids-sake, with Animal Packers. We'll let our Customers speak for us! My Grandson loves his Rocket backpack! Bought for our granddaughter and she takes it ed everywhere. My grandson loves it caries his clothes to grandmas house. Our great-granddaughters loved them! They are 3 and 4 years old cousins and both in day care. They could not wait to go to school and show off their backpacks! I'm always looking for a unique and special gift to give to the children instead of another toy at Christmas. I recently bought four of these adorable backpacks. One of the bears, two of the dogs and one bull. I can't wait to give them to my sweet nieces and nephews. They are going to love them. (as well as their parents) Great quality and so cute!! Love this backpack! It’s adorable and very soft! Awesome backpack my son loves it!!! I love the backpack & so does my nephew!! The cutest backpack ever!!! My son love his cow backpack. It’s light weight and easy to clean. Our 2 greatgranddaughters love them! I bought my grandson the Rocket backpack and he loved it! The design is super cute and the product is extremely well made. Great quality, durable kids back pack. I got this for my 3 year old granddaughter. I love how light weight this is for little kids and the stitching on this is top knotch! My two and a half year old grandson loves it! He loves batman so now he has a bat backpack he carries his treasures in! Well made and durable. Able to stand up to all his bat adventures! Nothing Else on the Market like this! Love Buckie the horse for my 3 year old. Well designed for little kids, easy zippers, super soft and FEATHER light! Holds lots of books and toys. The design is ADORABLE! Received lots of compliments already! She says it's so pretty and so soft. And I agree! It's so cute on her and she treats it like a stuffed animal. I love how quirky and fun this little bat backpack is. We get so many compliments! The large pocket in the front is perfect for snacks, and I can keep diapers, extra clothes, and a couple of toys in the main pocket. And fits my 16 month old perfectly! Great material and put together well. We have gotten a lot of compliements on it already!! My kids love the animal packers backpacks. They are cute and functional and the perfect size. I also love they they can be easily washed and cleaned. And I appreciate that they are ethically made. What’s not to love? My grandson loves his new backpack. He keeps all his favorite toys in and it is always either on his back or right by his side. He goes nowhere without it. Thanks for the home run Animal Backpacks. Perfect for my little guys! LOVE these backpacks, perfect size for my little guys. Regular kids backpacks purchased elsewheee have just swallowed them up! The fabric is perfect for those (more than occasional) spills, quick -drying, easy to clean. My boys love all the "secret" pockets on the front and sides. (I do too..perfect for water bottles, and sunscreen for quick access at camp) The colors are vibrant and fun, anything but a boring old backpack.. Finally someone thought of lil' guys & their needs! 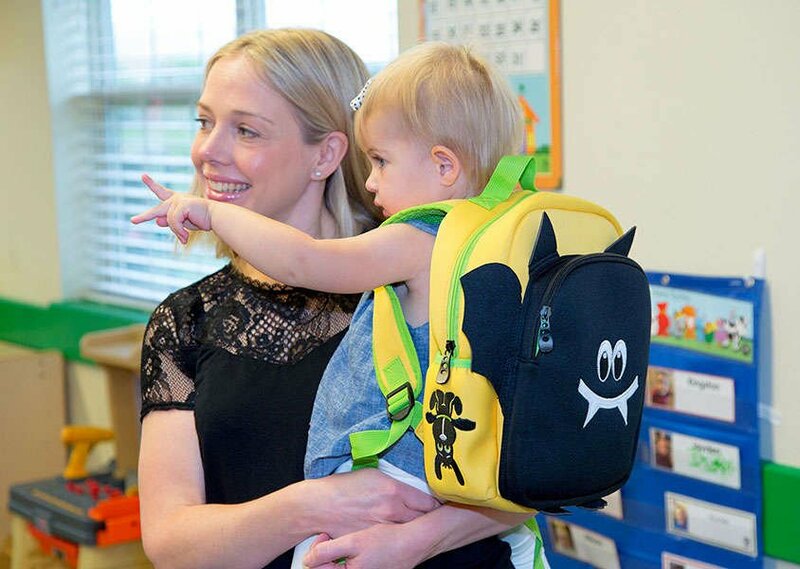 Perfect backpacks for little ones! My kids loved these backpacks. They are adorable and well-made, but very lightweight. My daughter especially loved all the pockets and that the dog collar clips and unclips. My daughter loves this back pack! It is the perfect size for her tiny frame, and made out of a light weight yet durable fabric that stays cool in our Texas heat. We can fit everything she needs for a day away from the house, and she can carry it all herself! A good kid’s backpack takes some weight off your shoulders, too!